On Fri., April 1, Young Harris College hosted the annual Spring Formal with the theme of Masquerade. 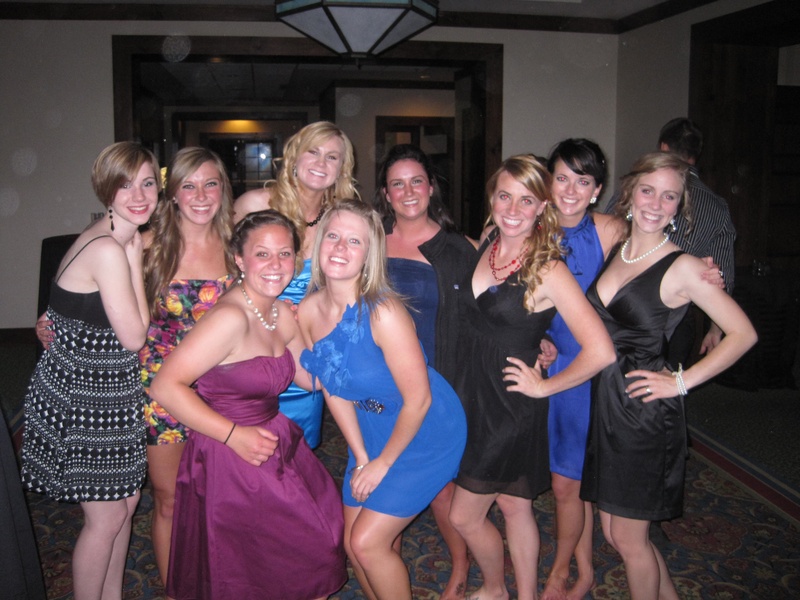 The majority of YHC students and their guests attended the dance, which was located at Brasstown Valley Resort. Students and their guests danced the night away starting from 8 p.m. and lasting until 12 a.m. Faculty and staff were also in attendance. Among those present were YHC President Cathy Cox and husband Mark Dehler, resident advisor director Dan Moore and Rouseline Emmanuel, director of Campus Activities. Walking into Brasstown, students were automatically plunged into a world of music, drinks and food. Freshman visual arts major Anita Hung of Marietta said, “I am glad to have seen people come and really enjoy themselves. Students wore an array of different dresses. There were short ones, long ones, puffy ones and fitted ones. One thing for sure is YHC students know how to dress for a formal, and enjoyed seeing each other dressed up. As the night went on the DJ played a variety of songs. Some songs played include Eric Clapton’s “Wonderful Tonight,” Jay Sean’s “Down” and Cascada’s “Every Time We Touch”. 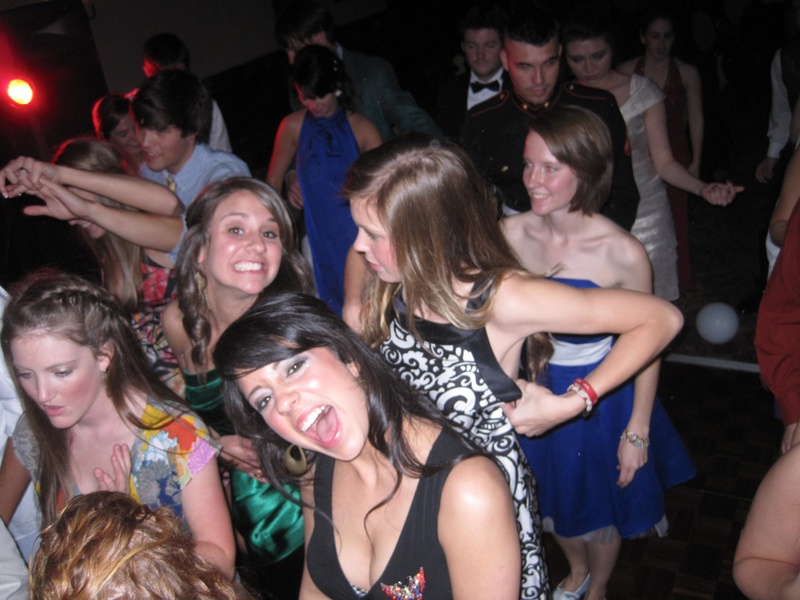 Because the spring formal is an annual part of the YHC traditions, students cannot wait for another round of the dance and fun in 2012. 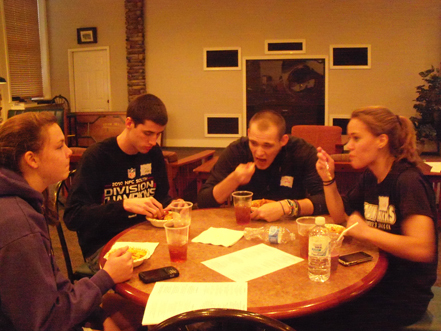 On Thursday, Feb. 24, the Baptist Collegiate Ministries met in the Myers Student Center to listen to a special speaker, join in fellowship and eat some homemade chili with cornbread and brownies on the side. Von Rogers an alumnus of YHC is the minister of BCM full-time at North Georgia College & State University, and part-time BCM minister at YHC. Rogers invited Josh Bennett to speak to students. Bennett is an associate pastor and youth minister at Macedonia Baptist Church of Hiawassee. “We must live to serve others, and servant hood evangelism will be the way that we bring people to Christ” Bennett said. The message was based off of 1 Corinthians 9:19. The message encouraged the audience to serve others like Christ would want them and to become more Christ-like. By serving others, people who are not believers may see the servant hood. Through that, nonbelievers in Christ may become believers as well. 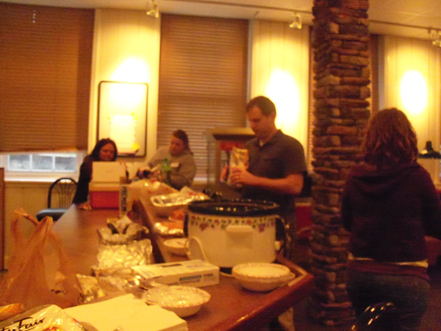 Members from Bennett’s church provided a meal of chili and corn bread along with brownies for desert for the event. Junior music major Tara Shiver was among the students in attendance. “This chili is stellar,” said Shiver as she sat around socializing with two of her friends. Shiver, a native of Covington, is an active member of BCM. Along with Shiver, there were 15 students and two faculty members in attendance. Rogers also introduced intern Katie Cargle, a resident of Dahlonega.Cargle is spending her internship working on campus ministries, Bible studies, discipleship and mission trips. After the message was delivered, worship was led by Daniel Willis a student of YHC, and an ending prayer was said by Amanda Noonan, a junior English major. BCM meets every Thursday at 6 p.m. in the Applebee East lobby.Upcoming events hosted by BCM include Dr. Xianzhi Song, assistant professor of chemistry speaking, and BCM will also be feeding hikers on the Appalachian Trail on March 26. The Young Harris College Theater department performed Shakespeare’s A Midsummer Night’s Dream on February 17-26 at Dobbs Theatre. The show sold out all 100 seats every night of showing. 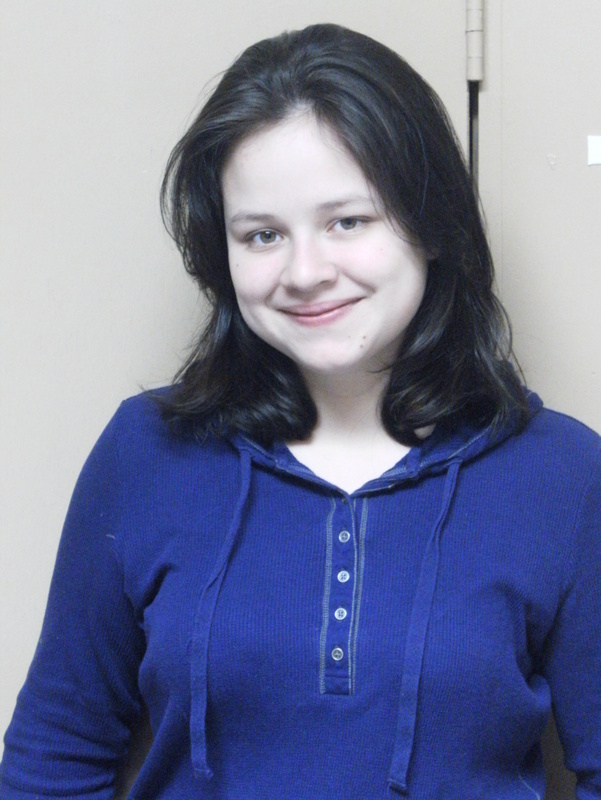 In order to sell out each night, Director Rachel Chaves enlisted the performances of YHC theater students. The cast included Austin Freeman as Theseus, Ashley ware as Hippolyta, Josiah Bridges as Egeus, Sarin Rossi as Hermia, Ryan Bender as Lysander, Sam Walker played Demetrius, Michelle Honaker played Helena, and Nancy Soule played Petra Quince. While Brandon Engelskirchen played Nick Bottom, Tyler Ogburn played Francis flute, Hayley Hoopingarner played Snout and Chase Alford played Starveling. The cast continues with Hannah Guest as Snug, Matt Jones as Puck, Tory Gravitt as Peaseblossom, Eddie Collins theater teacher played Oberon. To finalize the cast Misty Barber as Titania, Stephanie Sexton played Cobweb, Alyssa Lowery played Mustardseed, while Nicole Conrad played Moth, and Jordan Fleming played Philostrate and Seth Peters played the musician. Others contributing to the show includes scene and sound designer, Rob Sturgess, costume designer Kari Beth Rust and lightning designer Robert B. Fulton. The production staff included Rob Sturgess as technical director, custom shop supervisor Kari Beth Russ, stage manager Riley Noble, assistant director, and fight director Josiah Bridges, composer Seth Peters, choreographer Misty Barber, movement consultants Ki Curtis and George Koller. Assistant costume designer Tyler Ogburn, assistant lighting designer Becca Armstrong, assistant sound designer and sound board operator Evan McLean, assistant stage manager Ashley Loyd, properties artisans Marvin Hemphill, Brittany Hester and Laurie Tossing. Production staff continues with scenic artists Michael Brown and Liz McEntyre, light board operator Paige Crawford, scenic construction crew included Josh Gentry, Brittany Hester, Haley Hoopingarner, Ashley Loyd and Riley Noble. The electric crew included Rebecca Armstrong, Emily Espy, Austin Freeman, Josh Gentry, Brittany Hester, Hayley Hoopingarner and Riley Noble. 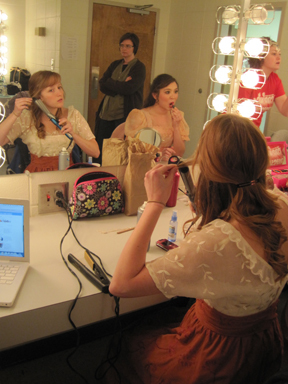 The wardrobe crew included Rebecca Fordyce, Katie Marlowe, Megan Ray, Dontay Scott and Sierra Vennes. With sold out shows every night, audience responses have been positive thus far. 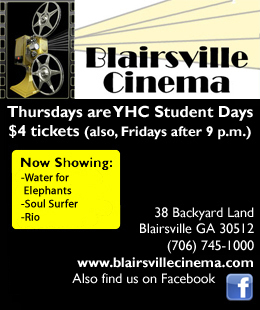 While YHC students enjoyed the show, perspective students from other schools also came to enjoy the show. Lavvorn is planning on transferring to YHC next semester to major in music. The show has received raving reviews, setting up big expectations for YHC’s production of Rogers and Hammerstein’s Carousel. The theater will host Delta Gamma’s The Actor’s Nightmare on March 2-3, Rogers and Hammerstein’s Carousel on April 15-17, and Delta Gamma’s Doubt in April. All these performances will be held in Dobbs Theatre. Students and faculty reversed roles at last Monday night’s faculty recital, when faculty delivered performances coming from an array of musical scholars. The show opened with a performance from Cynthia DeFoor, adjunct instructor of music and staff accompanist, on Piano playing Fredric Chopin’s Ballad, Op. 47 in Ab major. After, Karen Calloway, assistant professor of music, played on the piano with YHC accompanist Anita Guss. Calloway and Guss played Gioacchino Rossini’s La Pastorella delle Alpi (Tirolese) L’Invito (Bolero) and William Walton’s Rhyme. Later, Calloway, and Guss were joined by Sandy Calloway, associate professor of music and chair of the music department, to perform Andrew Lloyd Weber’s All I Ask of You. “I played Ballad, Op. 47 in Ab Major by Fredric Chopin because I played it in graduate school, and I really enjoy playing the piece. When I play it, I think of fairies. And, they change colors as the music changes,” said DeFoor. The concert proceeded with Karen Calloway leaving Guss and Sandy Calloway to perform Hermit Songs by Samuel Barber. After, Richard Knepp, instructor of music, performed Johann Sebastian Bach’s Grave. Then, Laura Stooksbury, adjunct instructor of music, sang Johannes Brahms Though I speak with Tongues of Angels while Mary Ann Fox, adjunct instructor of music played the piano. Fox and Stooksbury were then joined on stage by William Fox, and together they delivered a performance of G.F Handel’s When You Marry Me. Jeffrey Bauman , professor of music and director of choral and vocal activities, sang while Keith DeFoor, professor of music played piano to perform An die Musik by Franz Schubert and In the Still of the Night by Cole Porter. While community members were also enjoying their time, the show was coming to an end. Karen Calloway and Guss performed Gabriel Faure’s Fantasia with Callaway on the flute, and Guss playing the piano. After, Knepp performed Aquarelle by Sergio Assad. The show was closed with Robert Jennings Powell’s Angels Among Us played by Keith and Cynthia DeFoor on the Organ. The stage was managed by Sam Wolaver. As faculties were enjoying putting on the show, students were equally excited to have the chance to see their professors in action. “I always thought he would end up the president,” said Max Stallings in regards to his father Dr. Jody Stallings, an associate professor of biology at Young Harris College. Stallings departed for Kunduz, Afghanistan on Oct. 12, 2010. While in Afghanistan, Stallings has been working through US AID, an agency of the US that focuses on helping countries in their developing stages. Stallings works in a PRT, or a provincial reconstruction team. As part of a PRT team, Stallings is focusing on helping, along with shaping, communities in Afghanistan to trust and respect their governments. While in Afghanistan Stallings keeps an updated blog of his activities and gives a firsthand account of his experiences. The blog can be accessed through YHC connect website, or at https://connect.yhc.edu/stallings_blog/default.aspx. Each post includes Dr. Stallings thoughts and experiences thus far in his work. A snippet of Stallings’s post from December 15 reads, “In about two hours from now, I will be traveling to northern Afghanistan to establish myself in my “permanent” site in Kunduz province, in extreme north Afghanistan. It will be a welcome relief to unpack my bags that have been following me around for the past 50 days or so while in training in Washington, DC, in Arlington, VA, in W. Va, and in Indianapolis. I will live in a hooch. However, my 10×20 foot living quarters will be awesome: I will share this space with no one”. Dr. Stallings has been gone from YHC for almost 6 months now, and like his son, students are also waiting for his return. As students miss him, Dr. Stallings is also missing YHC and his students and co-workers. “He really misses it here. The students have such a great impact on him. He can’t wait to return, but for now he is doing his job, which he is really good at,” said Max Stallings. On his blog posted on Dec. 15, Stallings said he had “355 days left on this one year assignment.” Until his time in Afghanistan is finished, students and faculty are counting and eagerly awaiting Dr. Stallings’s return to the YHC campus.